Initially the choice of material for clothing was dictated by the nature and occupation of people. It can be traced to some specific examples. So, our primitive ancestors sometimes used underwater animal, making them clothes that protect them from water. At times it was manufactured from waterproof and guts and bladder of a seal or walrus and was a rain poncho with a hood (Fig. 1). The inhabitants of the far North were in the case and other materials. It was the home of deer, their fur has served man well. He used the skin of dogs pulling sleds. In the same territories, and also in continental Asia and North America became widespread clothing "parks" from a warm and delicate skins of birds. Not without a camel. The inhabitants of those districts where it was driven, made his camel wool cloth or felt. 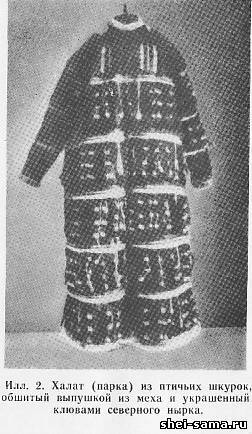 The settlers of the Amur river and its tributaries, as well as Sakhalin was used for clothing, fish and bird skin (Fig. 2). Then there are times when people master the art of weaving, spinning and weaving; begin practi threads and weave materials from sheep wool, and then open up other sources of raw materials - fibers cultivated plants, such as flax, hemp, cotton. Of course, this does not happen immediately, but gradually, and not everywhere, but in certain places, certain areas. With years, decades, for centuries, spreading information about new types of materials, the process of borrowing, increasing the production, moving forward the craftsmanship of tailoring. Historical, geographical, social, and ethnographic conditions of life of the people, their standard of living, technique of extraction and production of raw materials - all this is reflected in the clothes. Gradually realized that it is not "clothes make the man", and she is his creation, the result of centuries of effort of human genius. Her role as the companion of people at all stages of their struggle and activities is invaluable. Thanks to her, our distant predecessors was able to move from the warm lands and to settle in uninhabited part of the planet, to travel, to go hunting in unknown places, to conquer nature. Rivers, seas, oceans, climate, seasons ceased to frighten them, to serve as an obstacle in life. Clothing have saved a man from many diseases. And finally decorating his outer appearance, she along with other forms of art began to give him aesthetic pleasure. Here we come already to the question of the development of forms of clothes about its various modifications. In fact, all the garments originated from the individual elements. In ancient times, for example, the sleeve initially played an independent role. Pants also were not ligated and were worn on each leg separately. Gradually attire has varied, depending on its utilitarian functions, growth of production and culture, social and national differences among people and other factors. Initially, the clothes were very primitive and was divided mainly on shoulder and waist. The shoulder consisted of a piece of cloth slung over the shoulder (Fig. 3), and let's say, men's costume of the Greeks - from several pieces of fabric that are not sewn, and elaborately draped body. This costume consisted of two parts - lower shirt, called a chiton, and an upper cloak (the cloak rectangular) called a himation, which is superimposed over the left shoulder to the chest and back.Waist dress was used as a hip cover, from which are derived the apron, the skirt, the pants (Fig. 4). The Egyptians wore linen apron rectangular shape which is wrapped in different ways around the lower body and held on the hips with the help of a sash or belt. 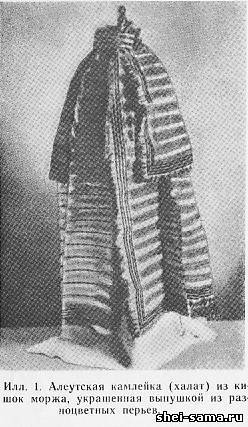 Later this primitive costume apron was replaced by a more complex type of shirt. She was made from a folded in half piece of material forming the front and back. In the center was done the neckline for the head and stitched the edges were left hand holes. This costume was called the ancient Egyptians and Romans the tunic. Women's clothing in Ancient Greece consisted of peplos - a large piece of woolen cloth, of rectangular form, the size of which has varied depending on social status and individual taste of women. Length peplos was different, and the color is mottled and patterned (Fig. 5). 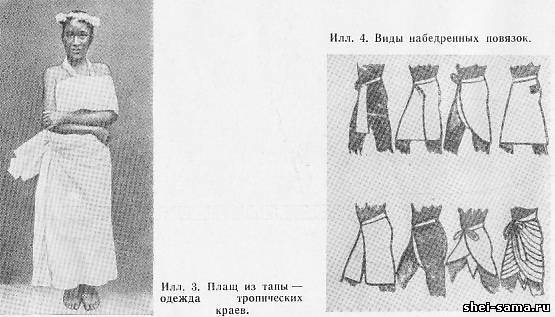 Was in use women's tunic with sleeves and without sleeves. It was made of painted in different shades of fabric and were decorated with various floral patterns. Later, when Greek women began to strongly emphasize the beauty of your body, upper heaton, which with its luxuriant folds concealed the dignity of the figure was abandoned and replaced by lower heaton, obligasi body from all sides. Among other costumes, Greek women it is worth mentioning himation. It is made from the same size piece of cloth as the peplos, and was worn as a mantle or cloak. Every woman (and the men who wore the himation,- Fig. 6) can according to your own taste to vary its form and way of wearing. The himation was used only in cities. On the road in the field worn gleno - cloak from a piece of solid matter of large size, which served for protection from wind, cold, rain, or mantle - a short coat, perekidyvaetsya over your left shoulder and zastayafshyysya on the right. Costume Roman women of that time almost nothing significant was different from the costume of Greek women. 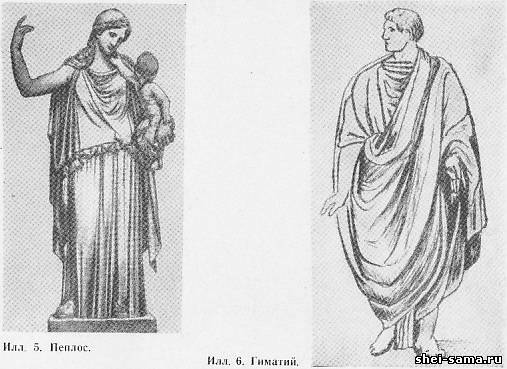 Clothes similar to the chiton, the Romans called the tunic. Exactly the same as the Roman cloak their appearance and way of dressing up like the Greek himation. Of major interest is the history of Russian garments. On it we will stop a few more.